Convert DWF to PDF. DWF Converter, DWF to PDF Converter. AutoCAD Design Web Format to Portable Document Format Conversion. The Smallest CAD Viewer in the world! Powerful and easy to use! As low as US$69 or €49. Publish your CAD drawings to Adobe PDF for easy distribution! Start from US$99 or €69. US$99 / €69 or even less. Convert your DWF drawings to Adobe PDF files without the need for Autodesk AutoCAD® or Adobe Acrobat®. Easy CAD to PDF Converter features DWF to PDF conversion. It is more than a file format converter, and you can even batch publish your DWG drawing files to PDF files of any size to answer your specific needs, such as to facilitate the readers of your CAD drawings who have no AutoCAD-based software products installed on their computers; PDF is an open standard for audiences from almost all walks. · Convert DXF, DWG, DWF drawings to Adobe PDF documents. 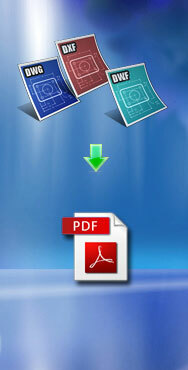 · Batch conversion from multiple drawing files to multiple PDF files or one merged PDF file. · Automatically search for drawing files in the folder of your choice including subfolders. · An editable file list collects drawing files from multiple locations. · Choose layout and layers, paper or model space for conversion. · Customize zoom ratio, line weight, and paper size. · Define PDF Properties including such meta data as title, subject, author, and keywords. · Select PDF orientation from landscape or portrait. · Grayscale output image files. · Load predefined page size (Letter, Legal, ANSI A/B/C/D/E, ARCH C/D/E/E1, ISO A0/A1/A2/A3/A4/B1/B2/B4/B5/C5, 700x1000 mm) for PDF output. · Support DWG, DXF, DWF files forward and backward with versions as early as AutoCAD Release 9 and as recent as AutoCAD 2017. · No need for Adobe Acrobat. Easy CAD to PDF Converter is shareware, and you can evaluate it for up to 15 days. When the evaluation is over, you are opt to buy the full version of the software or remove it from your computer. The full version of Easy CAD to PDF Converter software product can be obtained online after you pay the registration fee and get a license from one of our resellers worldwide. Before you install any Benzsoft software product, make sure that your computer meets the minimum software and hardware requirements. Operating system 32-bit or 64-bit Microsoft® Windows® 10, Windows 8.1, Windows 8, Windows 7, Windows Vista, Microsoft Windows XP, Microsoft Windows Media Center Edition, Microsoft Windows Server 2012, Microsoft Windows Server 2008, Microsoft Windows Server 2003.. Processor 32-bit or 64-bit Intel® Pentium®4 processor or AMD® Athlon®, Graphics card 1024 x 768 VGA with True Color, Requires a Windows-supported display adapter, Hard Disk 25 MB, Pointing device Mouse, trackball, or other device. User Guide for Easy CAD to PDF Converter Web Version, Printer-Friendly Version, Interactive Version. · DWF (Design Web Format) is a file format ideal for sharing drawing file information with team members, vendors, clients, subcontractors, and customers that do not have access to an AutoCAD-based application. · PDF (Adobe's Portable Document Format) is one of the most commonly-used file formats for sharing drawings with team member and clients who do not have AutoCAD-based application installed. It is a cross-platform data exchange format widely-used in Microsoft Windows, Mac OS X, Unix, Linux, HP-UX etc. © 2009-2019, Benzsoft Corporation. All rights reserved. Easy CAD Viewer and Easy CAD Converter are trademarks of Benzsoft. All other trademarks are trademarks of their respective owners.